FCA recalls 220,000 trucks because the brake pedals can detach when adjustable features are engaged. February 5, 2019 — More than 222,000 new 2019 Ram 1500 trucks are recalled because the adjustable brake pedals can fall off if the adjustable features are enabled. The brake pedals are activated by switches powered by electric motors and are designed to allow drivers to adjust the positions of the brake pedals. Fiat Chrysler (FCA) says an internal investigation determined the brake pedals can detach when the pedals are moved to the rear positions. More than a third of the trucks are still with dealerships and 2019 Ram 1500 trucks that aren't equipped with adjustable brake pedals are not included in this recall. 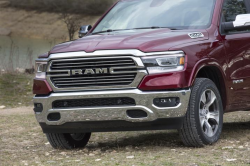 Nearly 194,000 trucks are located in the U.S., Canada has more than 22,000, Mexico is the home to 783 trucks and nearly 5,500 recalled 2019 Ram 1500s are located outside North America. FCA says the feature is recommended to use only when the truck isn't moving and should not be used until dealers make recall repairs, although no crashes or injuries have been reported. The Ram recall is expected to begin March 27, 2019. Owners may contact Chrysler at 800-853-1403 and request information about recall number V07. It hasn't been a good day for Ram drivers as FCA also announced a recall of 600,000 trucks following crash and injury reports related to steering problems. CarComplaints.com has complaints from Ram 1500 drivers.